If you’ve been living under a rock for the past few months you probably haven’t heard of Twitter. It’s a service that lets you write and post short messages that other people can read online or on their mobile devices. Some people call it micro-blogging, but that’s only because they don’t know how else to define it. It’s actually a a whole new communications channel, one that’s still firing off innovative uses of itself constantly. 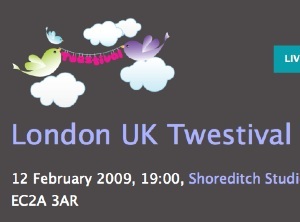 Twestival is an interesting example. Its essence is a meeting of like-minded people, nothing new there, but the method and speed of arrangement is new. By using Twitter, Amanda and the other events organisers have been able to arrange events in more that 180 cities across the world – including two virtual worlds – on the same day. Because of the immediacy of Twitter – the limit of 140 characters of each message forces brevity, but encourages frequency – ideas can be spread very quickly, much faster than blogging, the previous speedy way. The speed of receipt is often matched with a speed to response, more akin to the immediacy of an Instant Messenger (IM) conversation. This lead to the first batch of tickets for Twestival’s London event to vanish nearly as quickly as they were made available. It’s been in many media outlets such as the front page of London Metro, in the New York Times and will be on the BBC and other TV channels. We’re going along to the London Twestival and will report back how it goes. You can follow it as well using #twestival or watch it live on Live Earth.